Tesseracts 18: Open for Submissions! Well this is an all new topic for Tesseracts! And possibly a completely new topic for an anthology: a multi-faith, creative faith anthology of science fiction and fantasy. Who would have thought? Jacob wrestled with an angel in the night, earning him the name “Israel”, which means “struggles with god.” Buddha wrestled, and the hero of the Mahabarata wrestled too. Wrestling is a part of faith. Having a faith can help immensely with struggles in our lives, but we also must struggle against the rules, the boundaries, and the very doctrine at times. We all wrestle with our cultures and our gods, whether we believe in them or not. Faith is not passive. Human progress has relied on brave souls willing to challenge convention through their beliefs. And faith is not separate from Fantasy and Science Fiction. Fantastic elements are integral to all major faiths–they have their gods, fantastic creatures, miracles, blessings, power and magic. We continue that journey into space, possibly encountering worlds with their faiths. 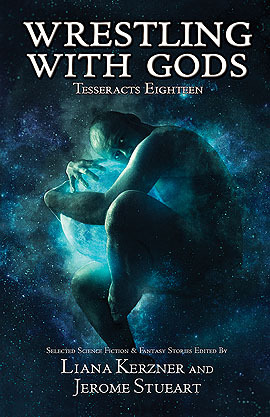 Since our cultures all began with fantasy and struggling with faith, Tesseracts 18 will continue the Science Fiction and Fantasy tradition of wrestling with Faith, without declaring all-out war. This anthology will include as diverse a representation of both real-world religions and faiths of fictional cultures as possible. Stories should not be looking to pass historical or cultural judgment, instead they should feature character-driven plots that include faith, doubt, miracles, spiritual journeys, and diversity of opinion within a faith. Please avoid blanket stereotypes of faith-based cultures. We’d love to see faith surprise us, and surprise science fiction and fantasy readers. How does Faith inform a culture, change a culture? What does it mean to really believe? 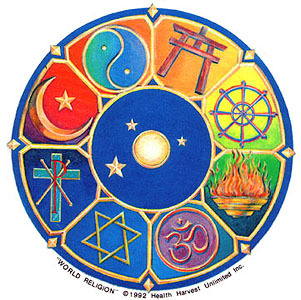 What kinds of religions and faiths are out there in the universe? How does faith play out already through established fantasy cultures? How can people keep believing, sometimes with very little evidence? Or is there evidence that is so personal, it is never shown to others? How does faith effect an individual, a family, a city, a society, a race, a conflict, love? What is the role of doubt and skepticism? Those on the fringe of belief are powerful characters. Characters who have doubts, struggles, disbelief enrich the conversation. Starting soon, we’ll start posting conversations about how science fiction and fantasy has dealt with faith and religion in the past—just to be able to talk about where we’ve come from, how those representations challenge the genre or challenge readers and writers. Mostly we just want to create a conversation about faith in fantasy and science fiction–in all its diversity! PLEASE join us. We’ll talk a blue streak with ourselves, but we’d just as soon have as many voices as possible in this conversation. Any one remember the author of a sci fi story in which the main character was dealing with two types of aliens. One type looked like angels the other devils, but the ‘angelic beings’ were the evil ones and the ‘demonic beings’ were the good guys. I read this in my youth, and it was an interesting twist. You don’t mean Childhood’s End by Arthur C. Clarke, do you? This is a *terrific* idea for an anthology. I’ll definitely spread the word. 🙂 I know quite a few folks who will be interested. Wow – that’s a great writing prompt! I have a question regarding multiple submissions (I know — the guidelines say “NO”): I was wondering, though, whether a writer can submit a second story if the first one is rejected, or if every writer submitting gets one shot only to submit a story.